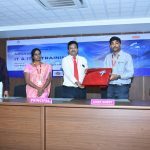 SPARK Association Inaugural function on 31.07.2013 & Guest Lecture on Transmission and Distribution by Er.Moses Samuel, BE.,MBA., A.E(Special Maintenance) – TNEB, Namakkal. Power Seminar on Present Industry Scenario. Power Seminar on Present Industry Scenario on Saturday 27.07.2013. 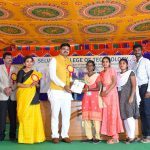 The Chief Guests are Mr.H. 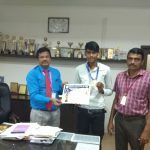 Vishwanathan, Associate Director-HR Mobius Tech, Mr.Ramesh Director GODS Technology and Mr.Adithya- Co Founder Sky fi Labs.Conducted by ICT Academy, organized by Department of Training and Placement. Two week ISTE Sponsored workshop on Analog Electronics. 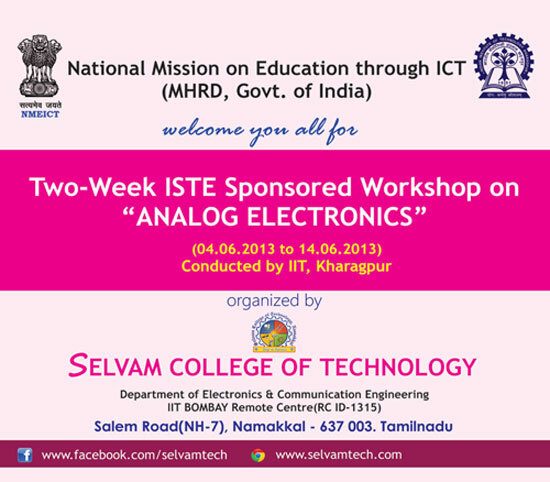 Two-Week ISTE Main Workshop on Analog Electronics Under the National Mission on Education through ICT(MHRD, Govt. of India)4th June – 14th June, 2013 Conducted by IIT Kharagpur. Two Week ISTE Sponsored Workshop on Database Management Systems. 2nd National Conference on ESCON-2013. 2nd National Conference on Advancement in Electrical power, Signal processing and Communication Network System (ESCON – 2013) during 15th and 16th March 2013. 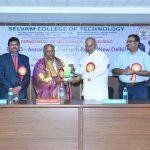 Second National Conference on Information Computational Algorithms and their Applications. Two Day Workshop on CYBROG – ROBOTICS 2013. Two Day Workshop on CYBROG – ROBOTICS 2013 on 05.03.13 and 06.03.13. Organized by Dept. EEE in association with AISEC IIT Kharagpur. Two Day Workshop on Open Source Software. Two Day Workshop on Industrial Automation Using PLC.